Don’t let Quill: The Life of a Guide Dog fool you: it looks like an adorable story of a puppy learning to be a guide dog and teaching his owner something about life along the way. It is, but it’s also almost cruel in how sad it is. Dog movies almost always end up being depressing in one way or another, but I keep hoping that I’ll find one that’s just sweet, uplifting, and nothing else. If you’re looking for a tearjerker, go no further than Quill. I can’t really complain about the tears it made me shed; I watched it on purpose looking to cry. I’d spent about a week so unbalanced from pregnancy hormones, crying at stupid things like missing pot lids, that I just couldn’t take it anymore. I needed to purge it all out of my system, and Quill did that for me. The last 45 minutes or so had me sobbing almost nonstop, to the bewilderment of both my dog — who jumped in my lap to comfort me, but after a while gave up — and my husband, who hid in the back room while I bawled at a television screen. This makes Quill sound like some twisted torture piece, and that’s just not true. Most of the movie is really quite sweet, if heart-achingly so. 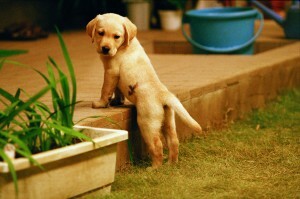 Quill is a golden retriever puppy named for the curious inky mark on his middle. He’s identified as the one puppy out of his litter qualified for service dog training. He spends a year with a foster family, then moves on to the training center. While out for walks with his trainer, Quill keeps running into Watanabe Mitsuru. 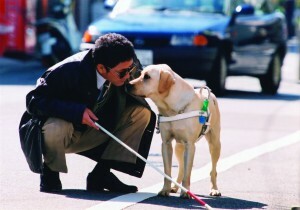 Mitsuru is the head of the local association for people with disabilities. 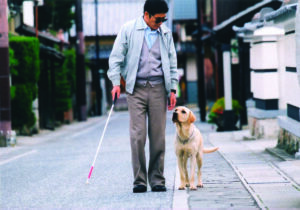 Satoru Tawada, Quill’s trainer, has been after him for years to get a guide dog — Mitsuru is blind — but Mitsuru hates dogs and won’t hear of it. Tawada finally convinces Mitsuru to just try out Quill for one morning, to see if Quill improves the ease or speed of Mitsuru’s commute. He does and so Mitsuru capitulates. But it’s not that easy. At least in the world of Quill (I don’t know much about how the service dog-owner relationship works in the real world), the dogs aren’t the only ones who need to be trained. Mitsuru moves into the training center for a month with the other service dog applicants, to learn how to share his life alongside Quill and utilize his dog’s abilities. Mitsuru is cantankerous and begrudges changes in his lifestyle. Although he sees the value of Quill — when he takes his dog to the disability association’s headquarters the first day, he’s bursting with pride to boast about and show off his dog — he doesn’t entirely trust Quill’s instincts. He wants to continue along as he always has, and only listen to Quill when he wants to, not when Quill wants him to. Quill and Mitsuru fail their first test. They have to stay at the center and continue training until they’re able to pass. Finally, Mitsuru is able to take Quill home to his family, including a young son who’s beside himself at the prospect of having a dog. Quill isn’t allowed inside the house, but Mitsuru’s son keeps trying to sneak Quill in anyway. The rest of the film takes place in domestic quietude, punctuated by the occasional small, amusing moments that make up our daily lives. If you just wanted a sweet story about a guide dog, this is where you should turn off the film. If you tuned in for a tearjerker, continue, and if you want to know more about what comes next, then keep reading. But be warned: spoilers in the following few paragraphs. All is well until Mitsuru falls ill. He’s moved into the hospital, where his faithful dog remains by his beside. Until one day, when Mitsuru’s son comes to take Quill away. Here is where the film plays its cruelest joke: at this point I assumed Mitsuru had passed, and the film would end, or open on a new chapter in Quill’s life — he was still a young dog, after all. We see Quill while away his days at the training center. Then we’re informed that Mitsuru was finally released from the hospital. Quill runs into the meeting room to greet him. Mitsuru pats him, and, shaky but determined, puts on his walking harness. They go out for a walk on the training center grounds, as I sob with relief on my sofa. As we watch them do so, a voiceover breaks into the touching moment. It informs us that Mitsuru and Quill’s last walk was only 30-some odd meters. The uplifting picture of dog and master fades away, and is replaced by one of a funeral. Quill is brought in to greet Mitsuru, in his coffin, one final time. That’s not even the end of it, but I won’t go into the rest. I only revealed as much as I did, because I want any interested viewers to know what they’re getting into. The makers of Quill might not take pleasure in their viewers’ pain — after all, for mystifying reasons, agony and sorrow seem to be standard parts of pet movies — but the number of sad twists in Quill’s story is almost cruel. Yet, these movies keep being made, so people other than hormonal pregnant women looking to expunge their tear supplies must enjoy watching them. If you’re made of sterner stuff than me, if you’re looking for a tearjerker, or if for any other reason the story appeals to you, know that Quill is good. The characters, canine ones included, are affecting. For all that I complain how sad it is, it’s a realistic film, and most of the time that’s a good thing. Quill acts like a dog, not like a comedic relief. Computer animation is only used once, in a scene when Quill falls and hurts himself — and that’s also not played for laughs; the graphics are used so no animals are harmed in its depiction. Quill quietly answers many questions we might have about guide dogs, and tells us a touching story about one in the process. It’s not for the softhearted, or at least for those who don’t want their movies to make them shed a few tears. For all that I sobbed that it seemed sadistic in its sadness, Quill: The Life of a Guide Dog is one of the best animal movies I’ve seen in years. 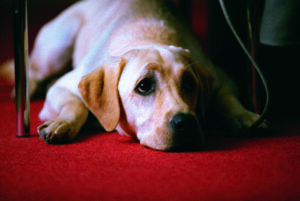 You can find Quill: The Life of a Guide Dog on Netflix Instant or Amazon.